The Oregon sunshine is upon us! Grab a team of co-workers, friends and/or family members, and enjoy a summertime baseball game. 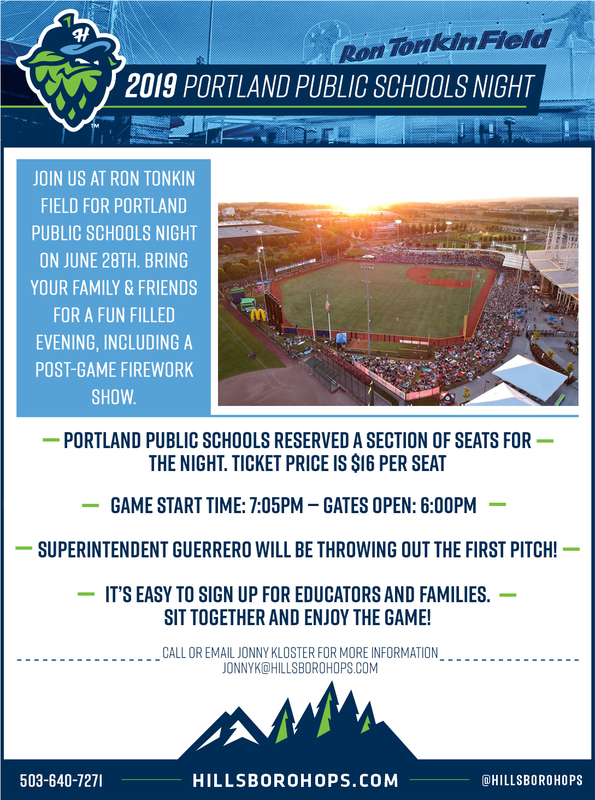 The Hillsboro Hops will host a Portland Public Schools Night on Friday, June 28 in celebration of a fantastic school year! Superintendent Guerrero will kick off the game with the first pitch, and we’ll celebrate with a post-game fireworks show. PPS will have special seats in section 16 and limited field reserved/bleacher seating. Reference this map for the field. Reserve your tickets at an exclusive PPS rate here. How do our prejudices affect our children? That question will be discussed during an event on Monday, April 22, at the Board Room of the Blanchard Education Service Center. The event, which is open to all, runs from 4 to 5:30 p.m. and will be hosted by the Conversation Project. A fair to help special education students prepare for life after high school will be held Tuesday, April 23 at Roosevelt High School. The Special Education Transition Resource Fair is open to all. Cascadia Behavioral Healthcare is offering Mental Health First Aid trainings in May to honor Mental Health Awareness Month. All trainings are free except for the cost of the training book ($20). Click "More" below for additional information. Please check out the new PPS Secretary Resources Page, developed by Lewis Principal’s Secretary Tracy Giordano and you! If you have questions about it, contact Tracy at tgiordano@pps.net. PPS staff are invited to attend Peace in Schools' Mindfulness for Youth-Serving Professionals Weekend on May 18-19, Oct. 5-6 or Dec. 7-8 and the Mindfulness Educator Retreat on July 11-14. Click "more" below for additional information and to register. Grab your PPS badge, and spring into action and live sport with this exclusive Adidas Employee Store pass valid through April 22, 2019. Nike invites all PPS staff to shop for some new spring gear. Grab your PPS badge and the Nike Employee Store invite for a one-time entry valid through April 30, 2019.